In many FGM affected countries no reliable data exists. Large country-wide surveys initiated by the UN are only done when the host state is explicitly agreeing. In several countries in Asia even surveys conducted by universities need an official permission. In other cases governments are keeping surveys by state universities in the locker. Yet, campaigns against FGM are often not taking off without reliable data. Local surveys can serve as “triggers” and door openers. They proof to decision makers that there is a problem. Whether local politicians or international organizations: They don’t need to act as long as there is no data. In most cases they will not act without data even if you engage in outspoken activism. Thus, the only possibility for anti-FGM activists is often to obtain the data themselves and go out to conduct their own surveys. Stop FGM Middle East is supporting such efforts. We have supported surveys or helped with translations or developing questions in Iran, Oman, Iraq, India and Singapore. 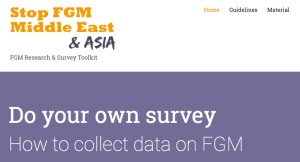 Now, we have developed an online platform where you will find instructions and advice on how to design a small & simple FGM-survey, how to extend it, how to evaluate and how to present the results. If you don’t want to do it all that simple you can also find a number of extensions and ideas about what and who else to ask. Guidelines and questionnaires are available in English, Persian, Arabic and Malay. Summary: The current scale aimed to design and assess an inventory for the level of knowledge about FGM and Its Complications. We drafted a 12-items scale based on expert’s opinion, FGM studies, new FGM broushores and Persian Manual awareness about female genital mutilation. Then validated it based on comments from three psychometry experts.